Our local public transportation system uses electronic cards (something like RFID technology) to validate rides. Users enter the vehicle and place their contactless card against a reader, and a beep tells them that the system has registered their presence. However, reading the cards takes quite a long time (2 or 3 seconds, so it's not just a regular swipe) and it's important that the card stay placed against the reader, otherwise it doesn't get recognised. The beep, on the other hand, only happens once the process is complete. What often happens is that the users swipe the card, receive no feedback, and think that it's not working (the cards are meant to stay inside your wallet so it's easy to think that it's just not close enough). How could this system be improved to communicate some (preferably audible) feedback that the card is being read, but that you shouldn't take it away just yet? Great question! This is an good case for microinteraction design. Provide clear feedback that the user should hold the card on the reader until an outcome. Since this is public transportation, provide blind- and deaf- friendly interface. Make it fast and memorable, so that passengers will "get it and remember it". Here's a sketch of a reader pedestal which uses physical cues, signage, sound and light to accomplish the objectives above in a single micro-interaction (click to enlarge). Color, texture, signage, sound and light provide access and affordance for blind, deaf, and color-blind passengers. Users will remember and avoid (social stigma) the error in the future. Also, passengers waiting in line to board the bus can hear the sound and will understand what the "correct" interaction should sound like. The soundtrack provides a good interface for the bus driver who may need to keep her eyes on the road/elsewhere...she can monitor unauthorized passengers. The entire interaction is language-independent. This is an integrated visual/audio approach. The console is designed so it can be physically retrofitted to existing readers (since it sits above the reader). If you don't have engineering or budget to do the visual bit, the audio design still works independently. This is where I'd argue that UX isn't the one to fix this. All they can do is apply duct tape and band aids to a poorly implemented technology. Fix the technology. It simply shouldn't take 3 seconds to read an RFID chip. On top of that, asking each person to wait 3 seconds to pass through seems like a logistical nightmare for crowd management. This is where it's critical that organizations understand that the technology decisions are the UX decisions. If the technology is poor, you've already failed at UX. I find it a common burden for UX teams to be seen more as 'make this bad technology slightly less bad' rather than a team that is brought in early enough to actually help with the technology decisions so that from day 1, the decision to implement a particular technology has a UX focus. In the Parliament of Ukraine they use both visual and audial means while voting, you can see youtube video (~10s). The sound consist of several tones which are percieved as the sequence, so stopping it somewhere in the middle sounds not natural. The row has some kind of harmony and natural feeling of the length. You could try to play some ~3s sound when the system recognizes the card and makes processing, so users understand the process is going on while sound is playing. Adding even single LED will allow for visual feedback for the processing, too. 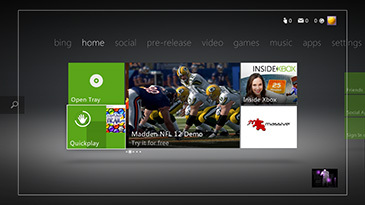 The XBox added a visual camera input device called the Kinect. They defined a number of gesture inputs, covered on the linked page and this one. This 2nd link includes the 'hold to select' gesture. This is somewhat cheesy, but it borrows the concept of a progress-bar. For your use case of reading and validating data, this gets tricky. If there's a long delay, you'll fall into the trap of the dreaded file transfer dialog. However, I think this could still work for you. It's important that the progress bar immediately show detectable movement. A user won't recognize the progress bar if it stays empty or fills up to 99% immediately. An animation of the first 25-50% filling over at least a second will get the point across. The task completes: progress bar quickly finishes, screen changes to a check mark, smiley face, whatever. Text: 'Thanks! Enjoy your $_thing. I mention the circle animation in particular because it seems to be gaining prominence. I've most recently seen it on the overly futuresque touch screen soda machines. You can start looking at existing systems in the public sector. Take for example pedestrian-crossing lights with a ticking sound for visually impaired people. It's a continuously ticking sound and it ticks fast enough to notice something is in progress. It can be a softer, shorter and different sound than the beep. For those who can't hear it can be combined with a visual sign which can also be borrowed from traffic lights: Red means "no card is hold against the reader", orange/yellow means "reading" and green "done". For color blind people you can support it with a status message or maybe simulate a real traffic light where the order of the lights matter. You could have the reader play a sequence of tones in a scale that move toward a resolution; when the card is done reading, a resolving chord would play. This would make it even clearer that the reader is done, eliminating any doubt as to whether the sequence of notes is finished. I believe this could be done in such a way that the resolving chord sounds right even when the reading-time is somewhat variable. Something like a more informative version of this idea that James Murphy had. Audio only feedback - Play a rising tone that ends in a pleasant note when finished. Initially users would not know what the tone meant but once they use it the first time they will be trained. Or play a slightly annoying sound that ends once the card is read. Think like the scratchy changing sound of the geiger counter. Visual feedback - A single yellow light that turns green would be very effective. Or you could print sticks that say "Hold card here, and wait for beep" in 3 languages and put them over the reader. You could make the system make short, quiet, periodic beeps (every 0.6 seconds or so - you can use this metronome at 100BPM to hear what that sounds like) to let the user know that the system is processing their card. The sounds need to be soft and frequent enough so that the user won't remove their card thinking that the first beep was an indication of success. If the user removes their card before the system finishes reading, it should play a low droning tone to convey that the system did not process it correctly. Users will be able to realize that an error occurred because the sound would only play after they remove their card while the "working" noise was indicating that the system was processing. A pleasant tone should play when the system finishes reading the card. The user will know that the system has finished processing because the "working" noise has stopped. Obviously, a short delay should occur before the system begins reading cards again so that the finished user can remove their card from the reading area. One system that is used in the city I live in: The reading apparatus is different between single beeps (check-in before entering the metro) and long reads (e.g. buying subscriptions). On the machines where the cards are read for a long time, the card is meant to be inserted in a sort of vertical slot, where the reader is, so it's I think evident for the user that the card stays there until told otherwise see picture, the slot is the gray rectangle just underneath the screen. Not the answer you're looking for? Browse other questions tagged accessibility physical user-feedback transport microinteractions or ask your own question. Agile Scrum: Framework to minimise the level of details that go into the definition of done? How to encourage people to move to the back of the bus?